A few years ago, feeling like I had watched every single British costume drama miniseries made since 1996, I embarked on a longer journey: Lark Rise to Candleford, a series which, at that point, was finished airing its four seasons. For those of you who are unfamiliar – and I imagine many of you are – Lark Rise to Candleford is based on Flora Thompson’s semi-autobiographical series of novels and is the story of Laura Timmins, a teenage girl who leaves the small Oxfordshire hamlet of Lark Rise for the neighboring market town of Candleford to assist her cousin, the capable postmistress Dorcas Lane (played by Julia Sawalha), as a letter carrier. Laura has difficulties reconciling her past as a poor – well, let’s say pastoral working class – girl with her new identity as an essential part of the bustling town’s economy. Over the course of the series, many other members of the two communities are introduced and developed in order to depict, in total, how both Lark Rise and Candleford are adapting to the changing landscape and rapid industrialization of the late nineteenth century. 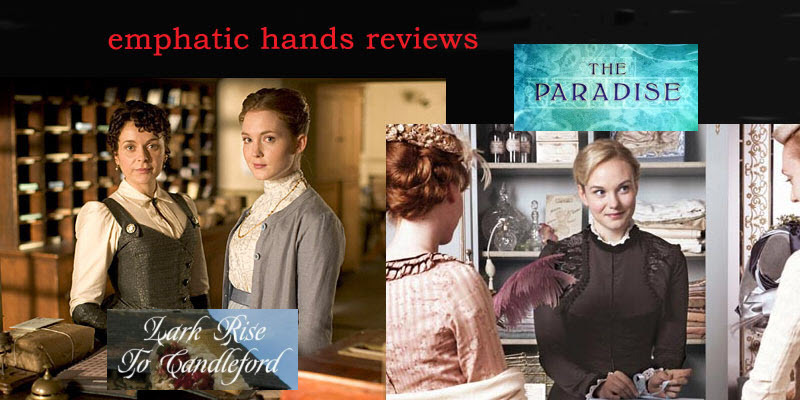 When I first began watching the show, I was immediately charmed and comforted by its Cranford-like qualities: the eccentric characters, the easy humor, the quaint setting, and the earnest, wholesome life lessons embedded in every episode. However, after two and a half seasons, all of this became cloying and I took a long break. (I’ve just resumed watching the series almost two years after I started.) I think some of the reasons that Cranford worked so much better for me than Lark Rise to Candleford, besides its superior writing, is that the first series is five episodes and the “sequel”, which was certainly not as satisfying, is only two. Lark Rise to Candleford averages almost ten episodes per season. This leaves ample room for the viewer to become worn out by heavy-handedness, character quirks, earnestness, and that very particular English sense that things were better in the past. On the other hand, there are certain characters who have been a delight to watch grow over the course of the series. Laura (played by Olivia Hallinan), as the main character, has had an interesting journey from seeming child to young adult. Dorcas Lane’s coming to terms with being a single, professional woman in a patriarchal society has been similarly fascinating, though disappointing at times. However, I’ve particularly liked watching Minnie, Dorcas Lane’s housemaid, who first appears in season two. Minnie is a source of comic relief in a show that takes itself a little too seriously. She started out as a blundering know-nothing and, as of the middle of the fourth season, is becoming a mostly competent young woman who has managed to retain a sense of wonder and a palatable amount of silliness. I’ve been watching another show, currently airing on PBS’s Masterpiece Theater, that reminds me a bit of Lark Rise to Candleford. First of all, The Paradise, which is for some reason based on Emile Zola’s Au Bonheur des Dames though it is set in a vague, nameless northern English city in the late nineteenth century, was created by Bill Gallagher, who also created Lark Rise. There’s a similar feel to the dialogue and it deals with many of the same broader themes, naturally, because it is about a rapidly changing society. The Paradise of the show’s name is a booming department store, where the show’s protagonist, Denise (played by Joanna Vanderham), begins working after her uncle denies her a position in his small drapery shop, conveniently located across the street. We don’t see much outside of the department store and the street that it’s on, aside from when characters venture to a local wealthy landowner’s estate, but one gets the sense that times are changing for the small, family businesses that the people of the city had frequented in the past. The Paradise is certainly nothing special. It’s soapy, mindless entertainment, but it satisfies my sweet tooth (for costume dramas). There is just the right amount of romance, treachery and cheeky humor to keep me coming back each week, and I can’t help but watch it while I’m snuggled up in bed with a cup of tea in hand. *If you want to see Coyle playing a really similar, but awesome, version of this character, watch North and South, a miniseries based on Elizabeth Gaskell’s novel, which deals with industrialization and the idealization of the pastoral and the shifting British class system much more deftly. I had a similar experience when I watched “Lark Rise to Candleford.” Gradually, after a dozen episodes or so, I couldn’t hold back from making snarky comments about how there was *always* gorgeous magic hour lighting in the village and it always seemed to be harvest time, and how Laura’s dad (and many of the characters) needed a good spanking. But I have started re-watching, at tea time so I am *literally* snuggling up with it and a cup of tea – and I am enjoying it more this time with a bit of an attitude adjustment. I just am expecting a lot less, and enjoying what it has more (that coziness). “North and South” was great. Much better use of the Coyle!